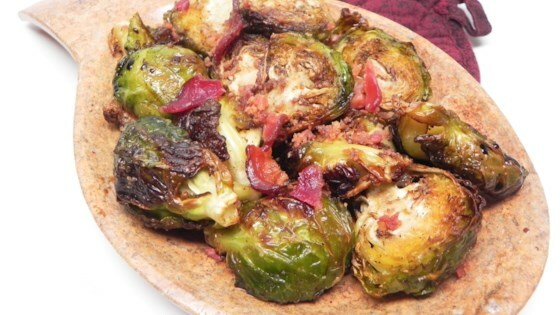 "Sweet and tart balsamic vinegar pairs well with the bitterness of Brussels sprouts; the bacon adds a smokey flavor. After 10 minutes, there's still some bite to the sprouts; add a few more minutes for a softer texture, if desired." Combine oil, salt, and pepper in a bowl and mix well. Add Brussels sprouts and turn to coat. Air fry for 5 minutes, shake the sprouts, and cook for an additional 5 minutes. Transfer sprouts to a serving dish and sprinkle with balsamic vinegar; turn to coat. Sprinkle with bacon. Incredibly easy to make and delicious. My brussel sprout haters even loved it! i can give it 5 stars next time should have cooked it lil bit longer was my fault not recipes .